Yes, I know it’s still only October, but if you’re anything like me, you’ll already have stashed away in a secret place at least one Christmas present, bought early to avoid the rush/grab a seasonal bargain/stop you panicking that you’ll leave it all till the last minute. In the interests of helping you along, I thought I’d post up on my blog today a free sample short story from Stocking Fillers (note to my American friends: that’s British English for Stocking Stuffers, rather than an indicator of an unexpected foray into erotica). The story that follows, a fun take on the annual Christmas letters that drop through so many of our letterboxes each year, is the first of twelve gently humorous tales in this seasonal collection. 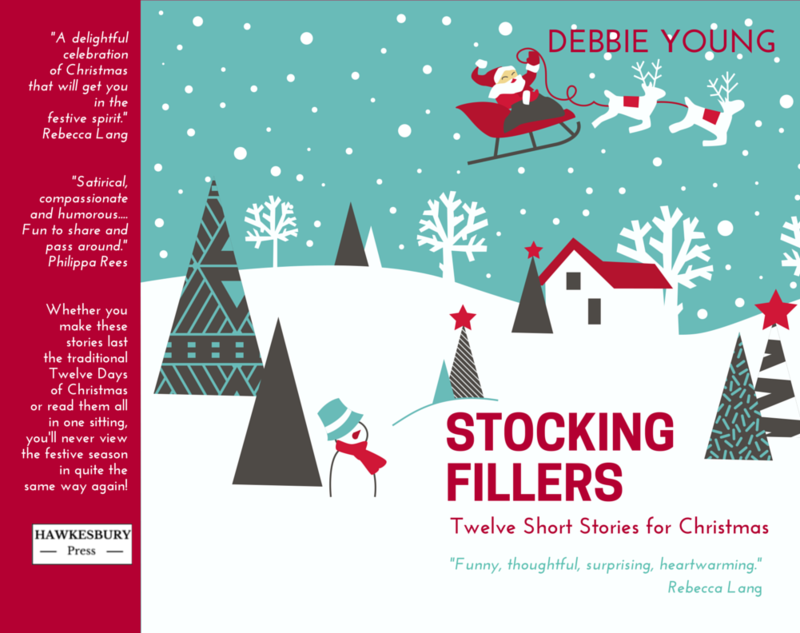 When I first published Stocking Fillers in time for Christmas 2014, one reader recommended it as an annual read in her household, to share with all the family as a reminder of the true spirit of Christmas – so a bit like Charles Dickens’ A Christmas Carol, only with more laughs, and without an interpretation by the Muppets (yet). If you enjoy this free story, you might like to snap up the whole collection, currently on special offer at just 99p/99c for the ebook, or in paperback for just £5/$8. It’s a slim, easy-to-wrap-and-post gift that I hope your friends and relations will enjoy. It’s available to order from all the usual suspects, including your local bookshop (quote ISBN 978-0993087929 to your favourite bookseller). I expect you’re wondering why this year’s Christmas letter is coming from me rather than the wife. The good news is that it will therefore be free of spelling mistakes and grammatical gaffes. That’s just the first surprise in our household’s annual round up. First, news of the offspring. You will doubtless recall from Trudy’s last Christmas letter, if she did a proper job of it, that our elder one, Caroline, was due to sit her A Level examinations this summer. Unfortunately I was the only one who took this challenge seriously. Painstakingly I prepared revision spreadsheets and progress graphs to direct her preparations. If only she had taken more notice of her father than of that inadequate boyfriend, Jake (or perhaps his name is James), she might have achieved the straight As I’d hoped for, instead of her feeble three Bs. She seemed not to care that this dismal performance would not get her into the medical school that I’d been planning for her since the day she was born. How she could throw away such a valuable prospect in favour of the performing arts, of all things, I do not understand. That is why I refused to go to Speech Day, where the only prizes she received were for worthless extra-curricular activities such as drama. If you ask me, she has wasted far too much time starring in school plays throughout her secondary education. I assumed her poor example would make young David buck his ideas up on entering the Lower Sixth in September, which indeed he needed to do if he is to have any chance of a career in Law. However he continued to fritter his time away on his wretched guitar. His uncanny ability to gain bookings for his band to perform live in pubs will certainly not fit him to succeed at the Bar. Neither the band’s success in some half-witted television talent show nor the resulting recording contract will convince me that he has not been wasting his time. Sadly, Trudy has been of very little help in keeping our children on the straight and narrow, being too deeply immersed in her own selfish interests. Since she started volunteering at that dreadful women’s refuge in March, she has lost all sight of her priorities. Very often there is not even a meal awaiting my return from the office. When I have asked her to explain why she bothers working there at all when I am perfectly able to provide for all her needs, she has not been forthcoming. Her entire conversation these days consists of regurgitating the opinions of some fool called Adam (or is it Adrian?) who runs the place. I assume the inane smile constantly on her face is caused by the contrast between her pleasant home life and the wretched state of those she works with. As for me, my continuing endeavours in the City have earned me a further promotion this year. My annual bonus was the largest I’ve ever received. It seemed only fair to treat myself to a new sports car on the proceeds – a two-seater Porsche 911 GT3, which features a six-cylinder naturally aspirated engine capable of as much as 500 HP, a top speed of 198 mph and 0-60 acceleration of 3.5 seconds. Never let it be said that, in my career and as head of the household, I do not continue to set a good example for my family. You can therefore imagine my surprise when I discovered that each member of my family had made separate plans for the festive season. Caroline, rejected of course by medical school, has set off with a travelling theatre company for a tour of Europe. When Trudy took a phone call from her last night, the girl revealed that by Christmas she would be in Turkey. Trudy laughed and said, “What a suitable place to spend Christmas.” I do not see why as it is 99 per cent Muslim. David, meanwhile, will be spending the school holidays performing in London with his band, paid for and, I hope, supervised by the television company. I remain deeply concerned about his attitude to his studies: he left behind the revision bag of schoolbooks that I had carefully packed for him. In their absence, Trudy has now announced that she’ll be working at the refuge throughout the Christmas holidays. Apparently Alan (or is it Andrew?) was especially keen to have her there. You’d think at her age she’d know better than to put up with such obvious bullying. Anyone would think she was the homeless one. I am therefore writing to you now, my dear friends and relations, to offer you the opportunity to have me spend the festive season with you. I’m afraid I won’t be able to satisfy you all, so it must be first come, first served. I apologise in advance to those who will inevitably be disappointed. I look forward to sharing more Christmas cheer with you. I anticipate your prompt reply. Next Post Like to Listen to my Podcast for Stoneham Press? What a great idea for a short story Debbie and written from such a wonderful point of view!! Thank you, Mari, I’m so glad you enjoyed it – it was fun to write, as you can probably tell! Who knows what The Good Lord asks us to do. Hilarity is your blessing.